Gone are the days when you would simply keep your dog in the backyard and rely on the existing fence to keep them in. In todays pet crazed world, people generally keep their dogs in the house and make them a part of the family. After all, this is what your dog wants anyway; he needs to be part of the pack! Along with this trend of indoor dogs comes the need for dog gates, Walk Through Dog Gates and fences to keep them out of certain off-limits areas. Most people dont want them dog roaming through their office or even the kitchen. Many times, the lure of food or mischieve becomes too strong and they give in to their urges. With a solid gate, you dont have to worry about this. Of course, they are also great for training your puppy. A high quality gate or fence is almost a requirement for puppy raising. It helps to teach them discipline. 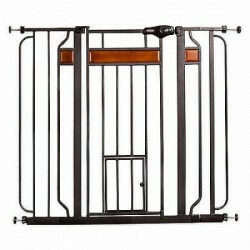 Pet Mountain offers a wide selection of dog gates, Metal Dog Gates, pet doors and fences. Whether for training, your kids safety, the comfort of your guests or just to give your dog some space, we have some great looking products that will match any home dcor. 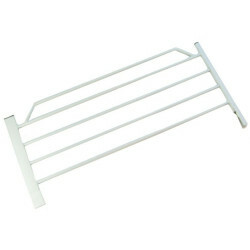 PetMountain also stocks a wide rand of Dog Gate Extensions for the Carlson Pet Gates. 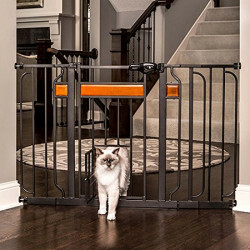 Wood Dog Gates are ideal for when you want to separate your pet from the rest of the house. 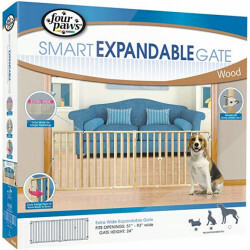 The Four Paws wooden gate is a popular model. 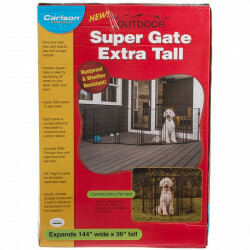 Extra Tall Pet Gates work great if you have a large dog and a small dog. It will keep the large dog confined while the little door in front allows you to let the small dog out. Pet Mountain also carries Extra Wide Pet Gates, which are also known as walk through pet gates. Our most popular Dog Gate brand is Carlson Pet Gate company known for their high quality and low prices. Dog Doors will help teach your dog self discipline and a familiarity with boundaries. When your home has a dog door, your dog will soon know when he's allowed in a room and when he's restricted. Its all part of the training process. When they get it, you'll be able to relax much more knowing your dog understands the rules. We also sell the Cat Mate Cat Flap, which can be easily installed in any door size and comes with the trimmable door liner. Cats can learn this stuff too! Take a look at our huge selection of dog gates, pet doors and fences. Discover all the specials and discounts. Cant find something? Let us know; well track it down. And dont miss our online coupons and discount shipping on all your favorite products.